One of my goals for this summer was to be a tourist in my hometown and in my mind that means trying out as many food places as possible. As someone who loves eating I am so lucky to live in Brighton where there is every conceivable cuisine available and with so much competition whatever you get is almost guaranteed to be incredible. However I don’t know about anyone else but I have this bad habit of sticking to my favourite restaurants and cafes and not branching out that much and by doing this I’m missing out on all the fantastic new places that spring up all the time. 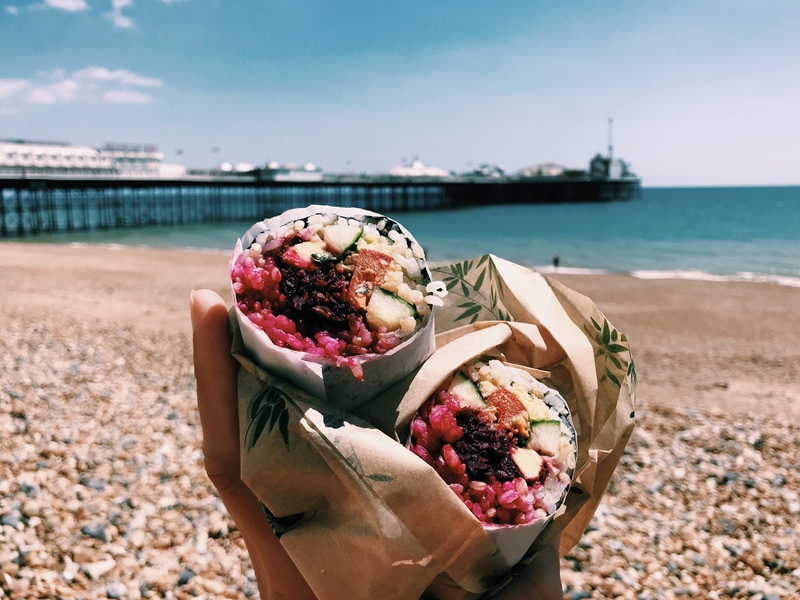 So I started to do a bit of research and a lot of talking about food and it turns out there are a ton of foodie favourites all over Brighton that I’ve not even heard of yet alone visited. Some of these exist outside of my normal walking routes, some of them are hiding in plain sight and some of them are places that I’ve just always discounted. Either way it seems that there’s a lot I’ve been missing out on in Brighton and it’s only when I started to look at the city through my ‘tourist tinted glasses’ that I realise how foodie a city Brighton really is. ONE PLACE that I kept getting recommended was Happy Maki. This little place is known for it’s all vegan sushi rolls and it seems that it’s a bit of an institution in the city, so I thought I’d better check it out. I didn’t really know if I was a vegan sushi roll kind of gal but there was only one way to find it out. This Brighton based company is located right by the coach station so I don’t know how I’ve missed it before. Either way today I went in and a new food obsession was born. It turns out I am most definitely a vegan sushi roll kind of gal. I could have eaten everything on the menu and I’m kicking myself for going to Pret for all these years. Rainbow sushi rolls, Thai sweet potato with roasted coconut and tereyaki sauce, ‘chicken’ with sweet chill sauce, I forgot the sushi rolls were even vegan. I went for the Beet and basil satay roll which came with beetroot, peanuts, satay sauce, avocado and chopped veg (ginger and wasabi optional). It was incredible. I don’t know what was more fun, watching them roll it in front of me or bringing it to the beach and taking these photos. Either way I’ll be back although at £6 a pop this could be a dangerous obsession. Stay tuned for more food related posts in Brighton. I’m on a (sushi) roll.